“There’s no gimmicks here just honest-to-goodness tradition and old-fashioned hospitality”. 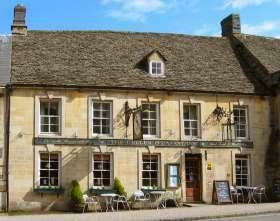 ‘Pub-with-rooms’ properties tend to fail expectations with the same galling consistency as an England penalty-shoot-out; but not this time. Sitting prettily on Burford High Street, the Golden Fleece offers a wise and superior take on the traditional British bolthole. Guests can look forward to a touch of Olde England in the cool stone floors and exposed oak-beams around the bar and the Fleece’s ten bedrooms enjoy the cool sophistication of a boutique or designer property. There’s no gimmicks here just honest-to-goodness tradition and old-fashioned hospitality. Guests with a passion for food will love the unique take on local favourites and meat and game dishes are given the attention and time they deserve. Single rooms and a four-poster bedroom available. A genuine taste of the Cotswolds.